The best option to maximise the weed seed bank is to harvest high and spread all of the weed seeds evenly over the paddock. This will give you something to spray next year. If you, like most others, feel that this is a bad idea, it may be time to start narrow windrow burning. Narrow windrow burning is a good place to start to see if this harvest weed seed control caper is all it is cracked up to be. The first step is to spend some time familiarising yourself with a beer can. 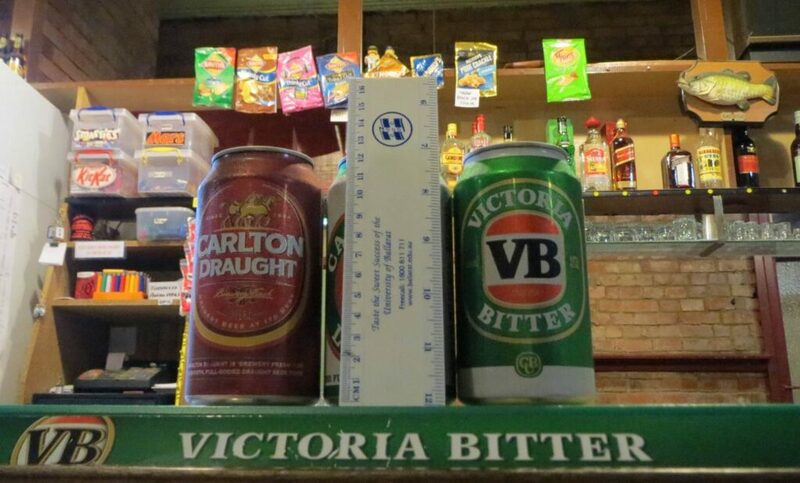 The internationally accepted harvest height when trying to capture weed seeds is the height of an Australian beer can. The next step is to work out how to modify your harvester to make narrow windrows. It’s easier than you think! Narrow windrow burning is widely adopted in Western Australia and is now set to be used by many interstate growers as the battle with herbicide resistant weeds grows. Many years of research has demonstrated that we can capture at least 60 to 70% of wild radish and annual ryegrass seeds at harvest. These can then be concentrated into a narrow windrow. When these windrows are burnt in the right conditions in the following autumn, 99 to 100% of the seeds are destroyed. This edition of AHRI insight will focus on how to make narrow windrows. We will follow up with information about how to burn them in autumn. Step 2. Harvest Low – remember the beer can! Step 3. Harvest low – we think you get the picture. Step 4. 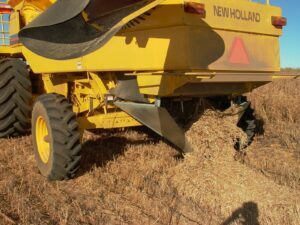 Make a narrow windrow chute. Narrow windrows (500 to 600mm wide) are ideal as they burn hotter for longer killing the weed seeds. They also minimise the area of the paddock that is burnt leaving enough residue in the paddock to minimise erosion risk. 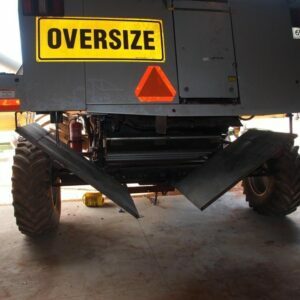 Below are some images of various windrow chutes for different harvesters. 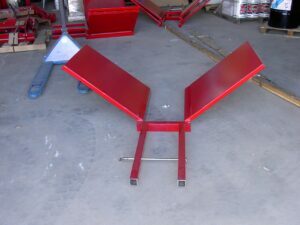 The Andrew Messina designed chute (pictured on the Case harvester) has proven to be the most popular design. Follow the link at the bottom of the page for CAD drawings of this chute that will help you to construct your own. Step 5. Crop choice – don’t bite off more than you can chew (no pun intended). For growers that are new to windrow burning it is best to start small. Ideally start with a small area of non-cereal in the first year of windrow burning. Canola is a great place to start as the windrows burn hot with little risk of the fire escaping to burn the entire paddock. Our research has shown that Canola windrows burn the hottest of all crop types (at up to 700oC). Lupin and other pulse crops are also a good place to start as the risk of fire escape is also lower. Wheat – ideally aim for wheat that is 2 t/ha yield or less. 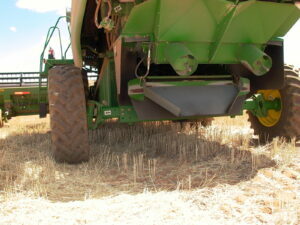 It is possible to successfully windrow as high as a 2.5 t/ha wheat crop, however, the risk of fire escape is much greater. If it is your first year of windrow burning it may be best to try only a small area of low yielding wheat. Barley – don’t even think about it! Barley is very leafy and almost impossible to burn narrow windrows without burning the whole paddock. Windrow barley at your own risk. 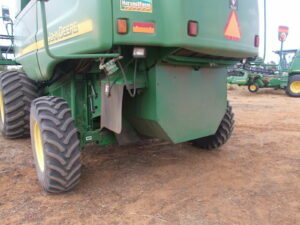 The chute on the harvester does restrict the flow of residue out of the back of the harvester. Stopping dead in the crop during harvest can lead to large blockages that take a lot of blood, sweat and swearing to clear. If you must stop, either pull out of the crop or go straight into reverse to allow residue to clear. The first thing to do is to harvest two or three boundary laps around the paddock. They will be the first windrows burnt in autumn forming a fire break. Up and back harvest is ideal but not essential. Up and back harvest makes life easy at burning time as it is easy to pick the right wind direction to burn a particular paddock. Growers that seed and harvest around the paddock can successfully make and burn windrows, they may take a little more attention to detail at burning time to get the wind direction right given the range of directions that the windrows are aligned to the wind. Grazing the paddock after harvest and before the burning of windrows can cause problems. Livestock can reduce the biomass of the windrow as well as spreading them out and making many small fire breaks. Ideally paddocks where narrow windrows have been made should not be grazed, however, a very light graze can be ok. A light graze with sheep can remove some of the leafy material from wheat stubble making it easier to contain the fire to the windrow during burning. However, generally speaking it is best to delay grazing windrowed paddocks until after burning. Harvest weed seed control is our number one non-herbicide tool and narrow windrow burning is a great introduction to removing weed seeds at harvest. The majority of growers that have used this practice are now convinced that harvest weed seed control will remain as an integral part of their farming system. 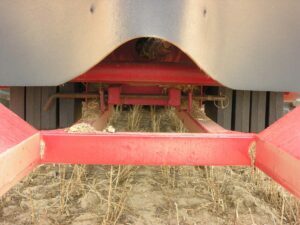 Some will persist with windrow burning and others will move to other forms of harvest weed seed control, like the chaff cart or Harrington Seed Destructor. Narrow windrow burning is ideally suited to the lower rainfall areas in Australia where crop yields are lower, however, it has a role to play for growers in higher rainfall areas, particularly for canola and pulse crops where the risk of fire escapes are lower.